So my project this weekend was running cat-6 cabling throughout the house, allowing me to move my Macs and AppleTV off the wifi and onto a gigabit ethernet. As part of that project, I wanted to modify my upstairs/downstairs roaming wifi network from one in which an Airport Express extended the network created by an Airport Extreme over wifi, to one in which the Express extended the network over ethernet. That proved a bit trickier than I expected, so I wanted to explain it here for the potential benefit of others. To clarify what I wanted to do: Previously, the Airport Express (upstairs) connected to the Airport Extreme (downstairs) over wifi (a network called “Hacienda”), and then extended the “Hacienda” wifi network to the upstairs area of my house. Configuring an Express to do this is very easy; you just select “Extend a wireless network”. The problem with such a setup, is that the Express is sharing its wifi bandwidth between two functions—communicating with the upstairs devices over wifi, and then passing that same traffic to the Airport Extreme downstairs, over wifi. Now with cabling everywhere, my plan was to connect the upstairs Express to the ethernet, so that it could extend the wifi network upstairs without having to communicate with the downstairs Extreme over wifi. The solution is to configure the upstairs Express in precisely the same way as the downstairs Extreme—i.e. you “create a wireless network” with the same name (“Hacienda” in my case) and the same password, and set the device to operate in “bridge mode”. Doing that, and everything works as expected. If you’re looking to do the same thing, I hope this article has helped. And if you have any questions, don’t hesitate to write. I have run the very same setup for a couple years. I have two AIrport express on opposite ends of the house on main floor connected back via CAT5 to Extreme in basement. Signal is 5/5 at any given place in the house. Handoff between access points is not smooth, however. If I recall correctly the wifi protocol sets system gain early in a given transmission so if you are mobile between two access points you might have issues. I don’t believe 802.11 a-n were intended for roaming use in the first place. I think AC may have adapted more for that purpose. Large house we have 3 wireless adapters and this method works, thanks for the confirmation. I was trying to set everything up as an extended wireless network using the wifi. Only addition would be to mention to keep the wireless networks on separate channels. I’ve been looking for an article/how-to on if the Airport Extreme can be in Bridge-Mode as well as the Airport Express being in Bridge-Mode. 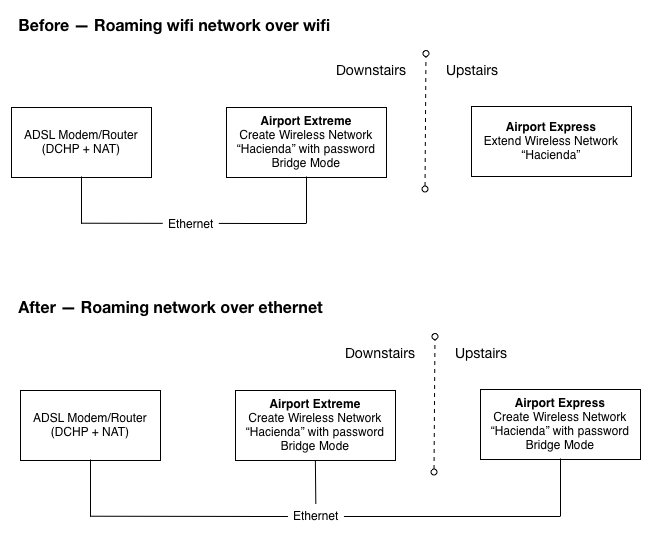 This is the first I’ve found — all others assume the Airport Extreme is placed to ‘Share an IP Address’ Great article with a simple, yet great diagram. Thank you! Matt, did you buy the cables, rj45s and pliers in an electronic shop locally or online? Can you provide me with a good address ? Amazingly, I’ve been looking for confirmation that this is the correct answer on the internets for days now. That has included time on the Apple support site and other blogs. None of that has been as clear as this write up. Thanks! I am going to make the leap that in my case, the fact that I’m going to connect the second Airport, in my case a second Airport Extreme, to the ethernet network via a MoCa link (from a TiVo Roamio actually) doesn’t matter. I will post again if I find that to be incorrect. Thank you very much for this very simple guide! It looks like it solved my problem. ONE question though, in your diagram above you say that the Airport Extreme (in my case a Netgear Router) has to have Bridge Mode enabled. Is it necessary or is it enough with AirPort Express having Bridge Mode on? ADSL Modem –> NetGear Router R7500 = Created Wireless Network “Home” with password and Bridge Mode DISABLED –> Wired connection from the NetGear Router R7500 to Airport Express = Created Wireless Network “Home” with password and Bridge Mode ENABLED. This works. We looked everywhere. But this is the only solution that worked. I want to note that we had the same error message coming all the time: “This mac’s ip address is already in use by another computer” Now we are fine. Bless you. Great write up. Can you clarify in your diagram if you are directly connecting your upstairs airport express to the downstairs airport extreme or if the upstairs unit connects directly to your router? Apple seems to suggest you daisy chain the devices (modem -> airport -> airport) but I haven’t been able to do this with both in bridge mode. In my case, I need my firewall / router to provide DHCP and both airports to be in bridge mode. Hi Greg, both airports and the router reside on the same ethernet network (i.e. they are connected to the same ethernet switch). Hope that helps! Nope. Nada. Didn’t work…. We have two networks (“company” and “company 5ghz”). Walk out of range of one and 5gh goes away. Also, use the other network and it never jumps to full signal, even though two airports share the exact same back end HP procurve switch. Networks are identical. Both have a static internal IP in bridged mode. In all my years of networking, this is by far the most frustrating, time consuming, crap product I’ve ever used. Ruckus is far easier and more reliable. i have set this up, but the second AE is only getting 2-4 mbps speeds during tests, the first AE is getting closer to 100mbps in tests. during speed test on second AE the light blinks and airport utility says it is not part of network anymore. then it comes back on network. both SE’s setup in bridge mode with same SSID and password. any ideas? by the way, my AE’s are daisy chained together. not both plugged directly into router. i thought that my way was the way Apple suggested. but if plugging both into router will cure my ills, i will try it. Mark, you mentioned that your Verizon gateway serves as your wireless router, but then mentioned later that the wireless radio is turned off. You can definitely connect your AirPort Extreme to your router, and create a wireless network, but that seems like it’d be your ONLY wireless network. Airport Utility 6 doesn’t offer an obvious bridge mode selection. How do I configure the same network using the current Airport Utility? Jeff, after you set up the Airport Express as a new network, there will then be an icon of the AE in the Airport Utility. If you click on the AE icon there, and click edit, you’ll see settings for the AE. The bridge mode setting is in the network tab. Thanks for the article, Matt. So stupid that Apple doesn’t seem to have this in their documentation. Your five year old blog post is still very relevant. Even more useful than Apple’s documentation. Thank you! Just used this to setup my Airport Express on bridge mode by creating a new wireless network. My other Time Capsule automatically set itself up on bridge, but with the Express, I had to create a network first and then manually change setting to bridge mode. Wow, thanks for the kind words, and glad it was of use!